We did some Koto Ryû taijutsu with Noguchi sensei, and I had a hard time crossing my legs correctly on each movement. I am more a Gyokko man. I got it right only when I began to train more slowly and kept my feet facing the same direction. Slow speed in the acquisition process, is very important to get this footwork motion right. As often in the Bujinkan, this is not the upper part of the body that matters, but the legs. You know that Bujinkan is about aruki. It couldn’t be more accurate than during this class. Last Friday, Hatsumi sensei spoke about the difference between the levels of omote waza and ura waza. His point, was that omote is physical, and is mental. But depending on the fighting system you train in, and of your technical level, there are other interpretations. On Sunday, Noguchi sensei’s movements were refreshing, and the lines of his legs defined a very nice Koto ryû space. The straight footwork of the Koto ryû have the correct distancing m and he could get his partner off balance without any strength. At one point, he insisted on going beyond the form, destructuring the original waza, in order to adapt it to uke’s reactions. It was a nice warm up that made sense when the class with Sōke began right after his. When in Japan, do not focus on the way Sensei and the Shihan unfold the techniques. Whatever they do, it will never be exactly what the original text say. Instead, try to “read between the lines” and learn how to “read” their movements. This is the best way to improve your taijutsu. 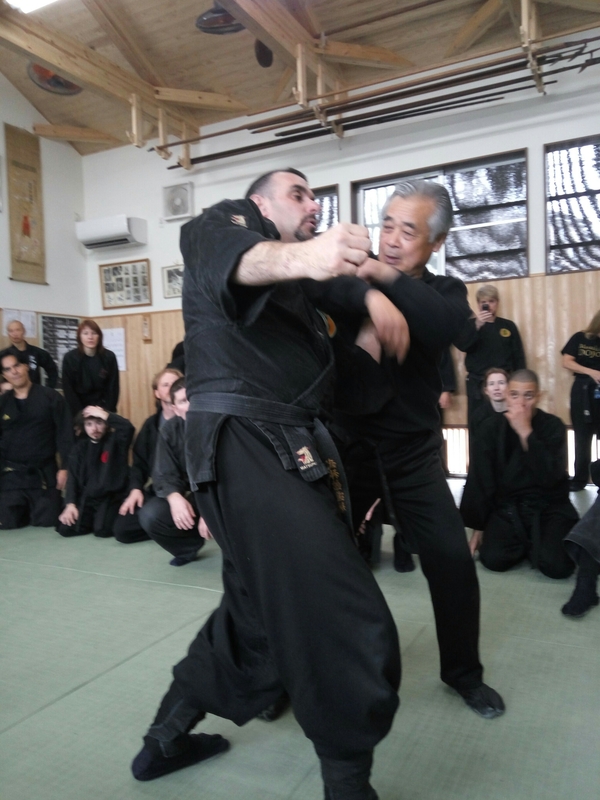 Obviously, it requires that you already know quite well the waza of every fighting system of the Bujinkan. Free flow comes from good basics. How do you want to adjust a movement if you don’t know it in the first place? Is impossible. Learn the waza, train the waza, then go to Japan and learn the flow of natural movement. This is why you train ride basics in your dōjō. The tenchijin leads to the ryûha (taijutsu and Buki). Ryûha lead to the honbu. There’s no shortcut. Excellence is based on the correct training in the fundamentals. Often I hear practitioners complaining that classes are not for beginners. Maybe that is why Sensei keeps repeating that he is teaching for Jūgodan. Understand me well. It is ok for beginners to come and train in Japan, but it will not be easy. At least they will have good memories. Beginners should come for the omote waza, advanced practitioners for the ura waza. 1. Reminder to beginners: Yoko aruki and Jûji aruki are two different ways of cruising the legs. Toes and feet facing the same direction = Koto ryû ; toes and feet perpendicular = Gyokko ryû. Thanks for providing clarity as to what a student should concentrate on when at Honbu. On a personal front, it gives me better clarity on what I should concentrate on improving. Sometimes, one can forget.